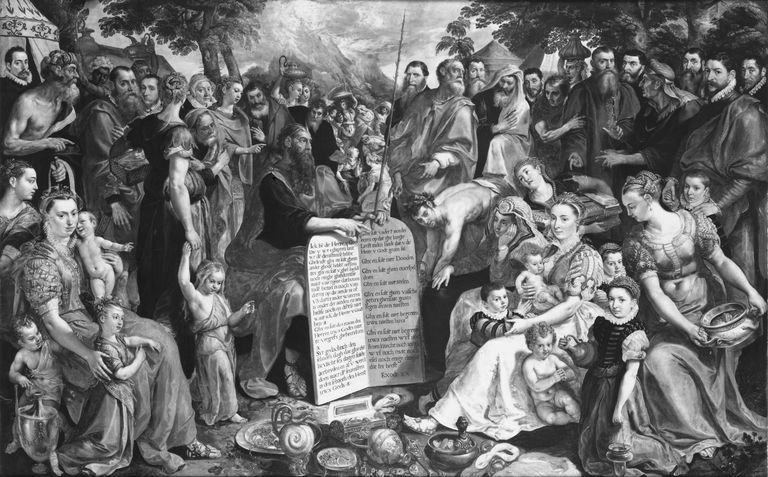 Moses Showing the Tablets of the Law to the Israelites by Maarten de Vos. Thou shalt not make unto thee any graven image or any likeness of anything that is in heaven above, or that is in the earth beneath, or that is in the water under the earth: Thou shalt not bow down thyself to them, nor serve them: for I the Lord thy God am a jealous God, visiting the iniquity of the fathers upon the children unto the third and fourth generation of them that hate me; And shewing mercy unto thousands of them that love me, and keep my commandments. This is one of the longest commandments, although people don’t generally realize this because in most lists the vast majority is cut out. If people remember it at all they remember only the first phrase: “Thou shalt not make unto thee any graven image,” but that alone is sufficient to cause controversy and disagreement. Some liberal theologians have even argued that this commandment originally consisted of only that nine-word phrase. It is believed by most theologians that this commandment was designed to underscore the radical difference between God as creator and God’s creation. It was common in various Near East religions to use representations of the gods to facilitate worship, but in ancient Judaism, this was prohibited because no aspect of the creation could adequately stand in for God. Human beings come closest to sharing in the attributes of divinity, but other than them it simply isn’t possible for anything in creation to suffice. Most scholars believe that the reference to “graven images” was a reference to idols of beings other than God. It does not say anything like “graven images of men” and the implication seems to be that if someone makes a graven image, it cannot possibly be one of God. Thus, even if they think they have made an idol of God, in reality, any idol is necessarily one of some other god. This is why this prohibition of graven images is normally regarded as being fundamentally connected to the prohibition of worshipping any other gods. It seems likely that the aniconic tradition was adhered to consistently in ancient Israel. Thus far no definite idol of Yahweh has been identified in any Hebrew sanctuaries. The closest that archaeologists have come across are crude depictions of a god and consort at Kuntillat Ajrud. Some believe that these may be images of Yahweh and Asherah, but this interpretation is disputed and uncertain. An aspect of this commandment that is often ignored is that of intergenerational guilt and punishment. According to this commandment, punishment for the crimes of one person will be placed on the heads of their children and children’s children down through four generations — or at least the crime of bowing down before the wrong god(s). For the ancient Hebrews, this wouldn’t have seemed a strange situation. An intensely tribal society, everything was communal in nature — especially religious worship. People didn’t establish relationships with God on a personal level, they did so on a tribal level. Punishments, too, could be communal in nature, especially when the crimes involved communal acts. It was also common in Near East cultures that an entire family group would be punished for the crimes of an individual member. This was no idle threat - Joshua 7 describes how Achan was executed alongside his sons and daughters after he was caught stealing things that God wanted for himself. All of this was done “before the Lord” and at God’s instigation; many soldiers had already died in battle because God was angry with the Israelites on account of one of them sinning. This, then, is was the nature of communal punishment — very real, very nasty, and very violent. That was then, though, and society has moved on. Today it would be a grave crime in itself to punish children for the acts of their fathers. No civilized society would do it — not even half-way civilized societies do it. Any “justice” system that visited the “iniquity” of a person on their children and children’s children down to the fourth generation would be rightly condemned as immoral and unjust. Should we not do the same for a government that suggests this is the right course of action? That, however, is exactly what we have when a government promotes the Ten Commandments as a proper foundation for either personal or public morality. Government representatives might try to defend their actions by leaving out this troubling portion, but in doing so they aren’t really promoting the Ten Commandments anymore, are they? Picking and choosing what parts of the Ten Commandments they will endorse is just as insulting to believers as endorsing any of them is to non-believers. In the same way that the government has no authority to single out the Ten Commandments for endorsement, the government has no authority to creatively edit them in an effort to make them as palatable as possible to the widest possible audience. This has been the subject of a great deal of controversy between various Christian churches over the centuries. Of particular importance here is the fact that while the Protestant version the Ten Commandments includes this, the Catholic does not. A prohibition against graven images, if read literally, would cause a number of problems for Catholics. Aside from the many statues of various saints as well as of Mary, Catholics also commonly use crucifixes that depict the body of Jesus whereas Protestants typically use an empty cross. Of course, both Catholic and Protestant churches commonly have stained glass windows that depict various religious figures, including Jesus, and they are also arguably violations of this commandment. Take ye therefore good heed unto yourselves; for ye saw no manner of similitude on the day that the Lord spake unto you in Horeb out of the midst of the fire: Lest ye corrupt yourselves, and make you a graven image, the similitude of any figure, the likeness of male or female, The likeness of any beast that is on the earth, the likeness of any winged fowl that flieth in the air, The likeness of any thing that creepeth on the ground, the likeness of any fish that is in the waters beneath the earth: And lest thou lift up thine eyes unto heaven, and when thou seest the sun, and the moon, and the stars, even all the host of heaven, shouldest be driven to worship them, and serve them, which the Lord thy God hath divided unto all nations under the whole heaven. It would be rare to find a Christian church that doesn’t violate this commandment and most either ignore the problem or interpret it in a metaphorical manner that is contrary to the text. The most common means to get around the problem is to insert an “and” between the prohibition against making graven images and the prohibition against worshipping them. Thus, it is thought that making graven images without bowing down and worshipping them is acceptable. Only a few denominations, like the Amish and Old Order Mennonites, continue to take the second commandment seriously — so seriously, in fact, that they often refuse to have their photographs taken. Traditional Jewish interpretations of this commandment do include objects like crucifixes as among those prohibited by the Second Commandment. Others go further and argue that the inclusion of “I the Lord thy God am a jealous God” is a prohibition against tolerating false religions or false Christian beliefs. Although Christians typically find a way to justify their own “graven images,” that doesn’t stop them from criticizing the “graven images” of others. Orthodox Christians criticize the Catholic tradition of statuary in churches. Catholics criticize the Orthodox veneration of icons. Some Protestant denominations criticize the stained glass windows used by Catholics and other Protestants. Jehovah’s Witnesses criticize the icons, statues, stained glass windows, and even crosses used by everyone else. None reject the use of all “graven images” in all contexts, even secular. One of the earliest debates among Christians over the way this commandment should be interpreted resulted in the Iconoclastic Controversy between the mid-8th century and the mid-9th century in the Byzantine Christian Church over the question of whether Christians should revere icons. Most unsophisticated believers tended to revere icons (they were called iconodules), but many political and religious leaders wanted to have them smashed because they believed that venerating icons was a form of idolatry (they were called iconoclasts). The controversy was inaugurated in 726 when Byzantine Emporer Leo III commanded that the image of Christ be taken down from the Chalke gate of the imperial palace. After much debate and controversy, the veneration of icons was officially restored and sanctioned during a council meeting in Nicaea in 787. However, conditions were put on their use — for example, they had to be painted flat with no features which stood out. Down through today icons play an important role in the Eastern Orthodox Church, serving as "windows" to heaven. One result of this conflict was that theologians developed a distinction between veneration and reverence (proskynesis) which was paid to icons and other religious figures, and adoration (latreia), which was owed to God alone. Another was bringing the term iconoclasm into currency, now used for any attempt to attack popular figures or icons.